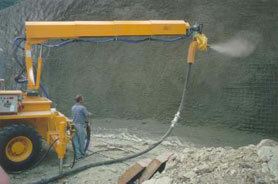 The Working of the shotcreting machines is based on the rotor principle.The concrete mix is transported by thin stream method (compressed air stream) to the spraying nozzle. Automatic lubrication of sealing plates reduce wear and abrasion and thus maintenance costs. A large number of well matched accessories allow maximum machine output with high-quality results. 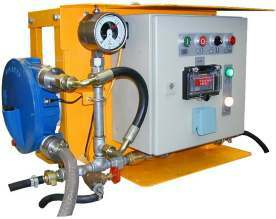 Thanks to pulsation free conveyance the thin- stream process is also suitable for manual spraying. The dosage unit is coupled to the shotcreting machine. The selected accelerator dose is automatically adapted in function of the output of the shotcreting machine. Cleaning of the machines is extremely simple and quick. Hopper and feeder drum swing open thanks to a rotating mechanism. 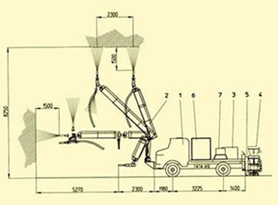 This Aliva 263i is a very sturdily constructed two-axle shotcreting machine for the processing of wet or dry mix. 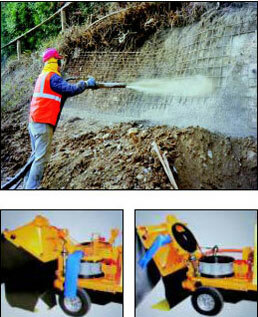 The machine is suitable either for manual spraying or by means of a robotic arm. 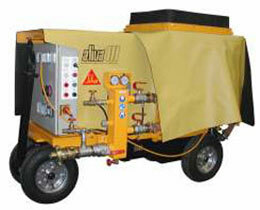 The Aliva 263i is developed for the application of shotcrete in tunnels, mines and slopes. 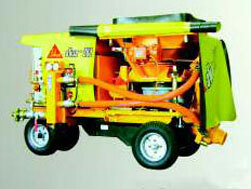 The machine has been designed especially for steel fibre spraying. The appropriately sized dosing unit Aliva 403 for Liquid accelerators enables an infinite setting of accelerator. 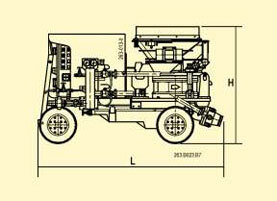 The Unit is equipped with a simple control which is done entirely on the dosing unit itself, i.e. the amount off additive is set manually by means of the dosing knob. Thanks to its simple and rigid construction, the Aliva 302 is very suitable for mounting onto different types of carriers. 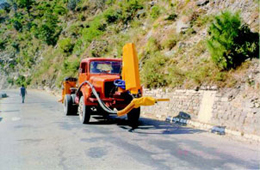 The Aliva 263i along with the Aliva 302 Telescopic Spraying(Robot) Arm and Liquid Dosing Unit can be mounted on a local truck chassis (e.g Tata SK 1613 or Leyland 1613s) to form an integrated shotcreting unit.